Tired of wanting to know why your not-for-profit organization or successful emerging firm can’t seem to get your story out? 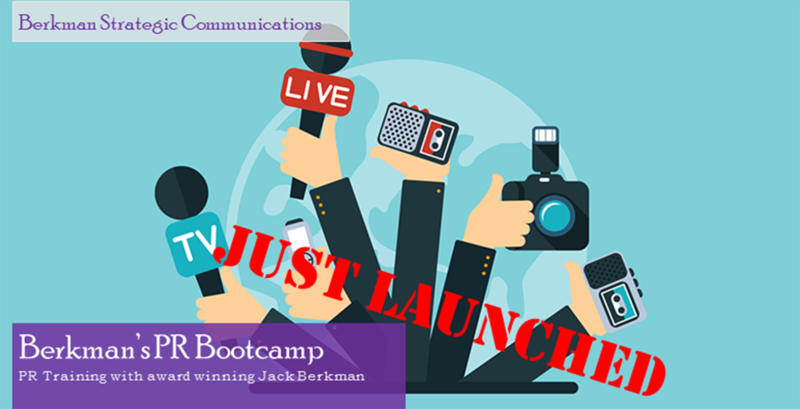 Finally, a comprehensive PR Bootcamp has been created by the Guru of PR, Jack Berkman. Berkman Strategic Communications has built ultimate workshop for you! CEO’s, marketing executives, development or new business executives, looking to understand the huge benefits of properly executed PR programs the smart way, will greatly benefit from this experience. We will examine what Public Relations entails and how to create exceptional brand recognition in the marketplace. The workshop will also work to bring all participants to a deeper understanding of their own company’s strengths and learn how to continuously separate and elevate their brand. We will cover topics such as media relations, key messages, brand management, effectiveness of ambassadors, media training and maximizing content resources. The comprehensive workshop will require dedication, a strong-work ethic and a sincere desire to succeed. This workshop will be held on December 6, Thursday (from 9am-3:30pm) will provide participants with the uppermost knowledge, presented by a recognizable voice in the PR industry. The bootcamp may be sponsored by companies, foundations, boards of directors or paid for directly by the participant. The presentation is tailored for organizations in the non-profit, law, medical, real estate, financial services field and more. Build your 2019 key messages now! Cost of the program is $550.00. Continental breakfast and light lunch included. For further questions please contact us at (619) 246-3404 or (619) 231-9977. Berkman Strategic Communications is a public relations firm in San Diego, CA that delivers high-value, results-driven marketing programs to clients across a variety of industries and disciplines. ©Copyright 2017 berkmanpr.com. All Right Reserved.